Reflecting 100 years of ILO – Shaping the rules for a new century of labour? The International Labour Organization (ILO) is celebrating its first 100 years at a time when labour is under massive attack. On the one hand, business and governments are pushing for new trade and investment agreements that provide for more rights for corporations at the expense of citizens as workers, consumers and at times at the cost of natural environment. On the other hand, an increasing number of governments are violating workers’ rights, curtailing some of the hard-won social gains by authoritarian means and undermining democratic principles. As governments hold half of the votes in the ILO and capital another quarter, labour is also on the defensive within the ILO. Without the ILO setting international labour rights and standards for 100 years, the conditions for labour would undoubtedly look worse today. However, labour faces a double challenge. Defensively, global and national rules curtailing its rights as well as the threat of erosion of the ILO as a rights-based and standard setting organization need to be fought. Offensively, the changing world of work with automation and digital technology needs new rules and enforcement mechanisms to defend and create decent working and living conditions, democratic societies as well as a sustainable future of the planet. 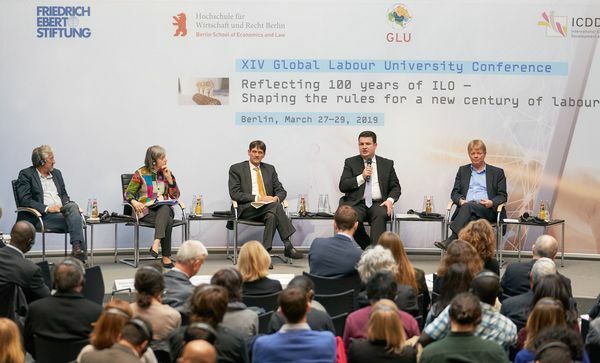 Against this background, the Global Labour University (GLU) wants to invite labour activists and academics to contribute to the global discourse on what kinds of new global rules are necessary, what role the ILO is expected to play in a system of global governance, and how we can strengthen international labour solidarity to obtain the rules needed.